Corinne Swainger is a freelance medical copywriter, and organises regular local meet-ups for other MedComms freelancers and remote workers living in and around North West London. They’re meeting tonight to celebrate MedComms Day, so I’m hoping for more pictures! Greetings from sunny Middlesex, in the suburbs of Greater London! As an independent medical copywriter, I love the diverse challenges that freelance life gives me, but like any other business, I still need to dedicate some essential time to focus my professional marketing plan. It was half-term last week, so I took some time off to assess my current and future business situation. During the past 12 years since I kicked off my freelance scientific career, pharmaceutical-healthcare communications have changed rapidly, which means I’ve had to adjust too, or risk getting left behind. While I’m looking to stay freelance in the future, I’m keen to find out what new marketing options are out there for small businesses like me. So, I’m talking to various colleagues inside and outside the industry for their thoughts before I take my next steps. As part of these changes, today, I’m been tweaking the logo for my MediQuill Ltd, and updating my professional LinkedIn profile. I’m also investigating whether I want to specialise on a more niche healthcare market. For example, in recent years, I’ve focused more on devising medical promotions and medical education for primary healthcare professionals and patients, rather writing abstracts and clinical research reviews for secondary care. I’ve also branched out into creating medical education and promotions for medical devices, so today, I’m considering if, and how I could offer more specific services to those types of clients. Finally, I’m definitely looking forward to catching up with a few other freelancers this evening to celebrate MedComms Day in our own way, at our local freelancers meet-up. Cheers! 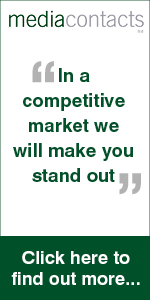 Corinne Swainger is a Freelance Medical Copywriter, Medical Writer and Editor based in London. Greetings from breezy, sunny Pinner, in North-West London, where I’m stopping for lunch during my busy freelance day. As it happens, my teenage son didn’t go into school today since he wasn’t well overnight. But working from home means I can keep an eye on his recovery here, while still progressing with my work. Today, at MediQuill Ltd, I’m juggling some interesting assignments. These include developing a new strategic story flow for a renal product advertising campaign, and mapping out associated content for an interactive visual aid to differentiate this drug over the competition. So it’s time to integrate some emotional messages into the campaign! Before getting into MedComms, I started my career as a staff healthcare copywriter in a Florida hospital working with doctors, nurses and patients to promote the hospital’s clinical services. As such, I was taught that the best advertising and PR campaign messages appeal to a person’s emotions. And I think that’s still true, especially in MedComms. Sometimes, we forget that healthcare professionals are people too, and they will respond to moving messages rather than just clinical logic when making treatment decisions. Today, I’m also ghost-writing a proposal to present the benefits of my client’s European pharmaceutical wholesaler services to a global pharmaceutical company. I’m also discussing a potential new project with a freelance medical editor whose client is looking for a PR healthcare writer. Plus, I’m getting a breath of fresh air in the local Pinner park to enjoy that lovely sunshine. Freelancing can sometimes be isolating, which is why I try to get out of the house every day to just connect with people. After 20 years, I still love working in MedComms – and this has increased over the past 10 years since I began freelancing and founded MediQuill Ltd. There is always so much diversity in this industry, as shown by the postings from around the world on #MedComms Day. I look forward to reading more of them. 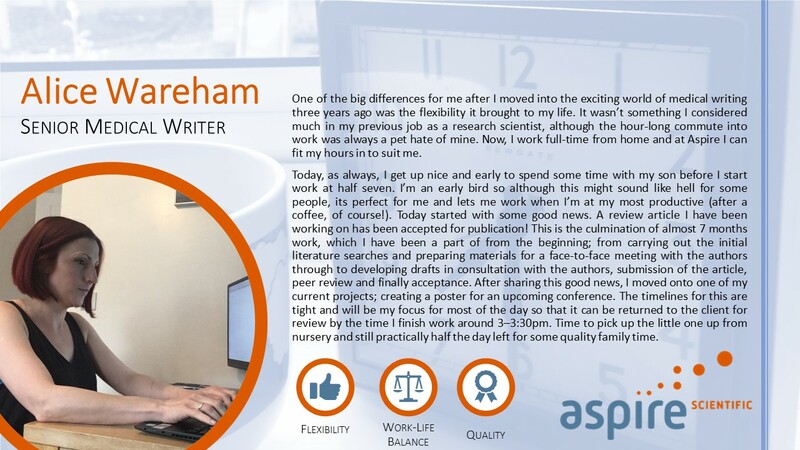 Jo Chapman is a Senior Medical Writer at Aspire Scientific in the UK. Jessica Millar, one of the Associate Medical Writers at Kainic Medical Communications reflects on here new working life in MedComms. As I finally saunter out of bed after snoozing four alarms I leisurely make my bacon and eggs for breakfast, put the kettle on and sit down to read the news, or in today’s case, the MedComms Day site. This is my first ever MedComms Day! I realise my morning sounds unlike everyone else’s crazy work-filled day. We’re relatively easy going here in chilly Dunedin and as I rock up to the office around 9am I am pleased that the heat pump is on, I have an electric blanket and a cup of tea, and I can sit down and listen to Blair deliver his morning briefing. I’ve had plenty to do lately, which is a marvellous distraction as I am currently in the dreaded, seemingly endless black hole between handing in my thesis and waiting for my examiners to agree on when would be a good time to grill me on all my apparent knowledge. I’m super lucky I got this job. I knew for a fact that I didn’t want to be an academic so doing a PhD certainly wasn’t a waste of time per se, but it definitely taught me how not to live my life if I want to be happy and (relatively) sane. In my little academic hovel I didn’t even know what MedComms really was until I stumbled across Kainic. Blair was silly enough to employ me toward the end of writing my thesis so I probably made quite the crazy impression, but I’m still currently employed so it can’t have been that bad. I was so used to 5AM starts and 8PM finishes during the testing phase of my PhD that now that I’m in my real, grown-up job, I seriously appreciate 9AM starts and whatever-time-I-want finishes. I have weekends, I have free-time, I get to learn something new almost every day. Plus, I get to keep on studying, because I’m a forever-student. Below is a picture of me ‘working/learning’ at home, with a blanket and the fire going and one of my dogs pleading for a cuddle. So far post-PhD life isn’t traumatic at all. It’s actually quite lovely. 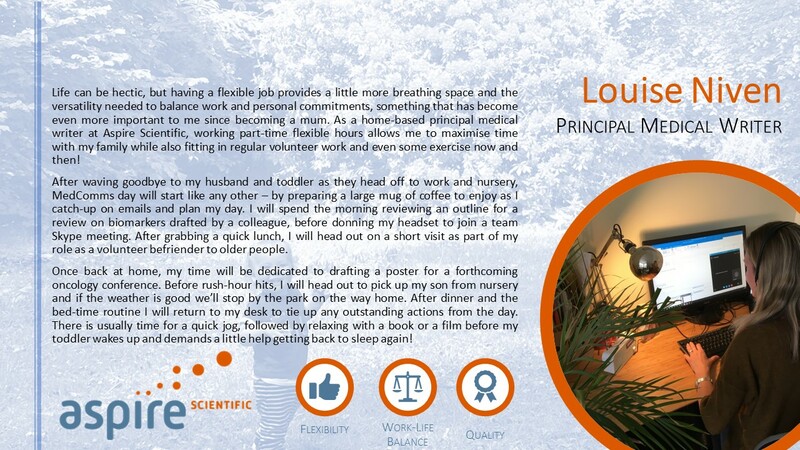 Lyndal Staples, Freelance Medical Writer, is settling down to her #MedComms working day in the home office. It’s a good morning from me in Napier, New Zealand. I’ve just got home from the (highly stressful) school/day care run. Nothing like a 3-year-old on a scooter to test your mettle first thing in the morning! I’ve got my coffee and am about to attack my to-do list. As a freelance medical writer, I’ve been fortunate to have back-to-back long-term contracts for the best part of this year. Things have been busy and the work has been varied: manuscripts, abstracts, slide decks, clinical trial summaries, desk research, literature reviews, etc., etc. So, no complaints from me. I’m still ticking along in my home office (slash laundry). Although I’ve given quite a bit of thought to hiring shared office space, I’d probably only do that if I went full time. I’d love the company of other people during the day but it’s hard to justify the expense when working from home costs more or less nothing. Plus, I’ll get my fix later this year when I attend the annual Australasian Medical Writers Association conference in Sydney, Australia. I attended my first conference last year and it was great to meet other people who do what I do (and who get what I do). Oh, and a trip to ‘Straya’ just seemed too hard to turn down! Looking forward to seeing what everyone else in #MedComms is up to as people log on for the day. It’s great to have initiatives like this one to remind me that I’m part of a global community, despite living at the bottom of the world! Let’s pretend… a reality check from Trinidad! Let’s pretend that my life as a freelance writer living on a yacht and sailing around the world is half as glamorous as you all think that it is and that Peter makes out! The reality is a little different. The boat is on the hard in a boatyard while we do a major refit and I have to climb a ladder every time that I pop to the loo. Inside the boat, I am pretending that I have a real desk, as I am waiting for a new chart table/desk to be fitted. I am feeling inspired in the desk department by the lovely spacious agency offices and cozy home offices in the photos posted from around the MedComms world! The Aspire Scientific team have written in to say they’ve been hard at work from their various locations across the country on a number of exciting medical writing projects. For Senior Medical Writer Jo Chapman, the day always starts with getting the kids to the school bus on time followed by a dog walk through the fields. Today, there were a few obstacles in her the way and they were not going to move! Once home and settled at her desk, Jo proceeded to provide support for a manuscript submission, compiling a list of all those last minute bits of information that are necessary but different for each journal! She then completed an article for the The Publication Plan, a free online news resource run by Aspire Scientific. After waking up bright and early thanks to her 20-month old human alarm clock, Medical Writer Alice Wareham made the short commute up the stairs to begin reviewing a manuscript reporting preclinical data for a new drug formulation. In the afternoon, Alice helped finalise the first draft of manuscript assessing a new technology for measuring breathing disturbances in young children with asthma. She finished the day by taking a brisk walk through the beautiful countryside near her home in Shaftesbury, Wiltshire. Today has been a day for doing lots of small but important jobs for Senior Medical Writer, Philippa Flemming. She started by checking figures that have been redrawn by our graphic designers for a manuscript about the use of a biosimilar in the treatment of rheumatoid arthritis. That done, she moved on to error read a piece of work that has been completed by one of our talented writers. This afternoon she will be concentrating on finishing off some lay summaries of recently published articles that Aspire have been involved with, as well as helping develop slides for an upcoming pitch. Philippa promises she wasn’t sunbathing when she took this picture from our office roof in beautiful Oxfordshire this lunchtime. Today, Principal Medical Writer Louise Niven has been focussing on The Publication Plan, Aspire’s central online news resource for medical publication professionals. The day began by accepting requests from readers wishing to keep up to date with news from The Publication Plan through its dedicated LinkedIn group, followed by a quick search for any new and relevant stories that should be summarised for the site. She went on to write a special post to mark a Day in the Life of MedComms. This afternoon she has been reviewing the latest summaries written by her talented colleagues at Aspire… with a little help from a friend! Working from our office in Oxfordshire, Director Rick Flemming has been reviewing a manuscript reporting preclinical data on a promising new analgesic drug that has recently progressed to late-stage clinical trials. Other jobs included preparing for the arrival of two new Aspire employees next week and discussing the company’s plans for our annual summer meeting. As you can see, it’s been a hot day in Stanford in the Vale!